Kintrails is a collection of over 9000 individuals consisting of approximately 10,000 note pages and 80,000 text references. It is primarily the work of Gloria Beek and Linda Etty. A host of family and friends have given tremendous input from Australia, Bermuda, Canada, England, Ireland, New Zealand, South Africa and USA. We thank everyone. This is work in progress. We ask that this collection of material be treated with respect and without monetary gain. “Beek Family History”, a 180 page book printed in 2007. is now available from Gloria Beek. It is an introduction to the Beek family of British descent. We hope to prepare additional print documents for other family lines. Anniversary Party for David and Edith (Dashper)Stewart. 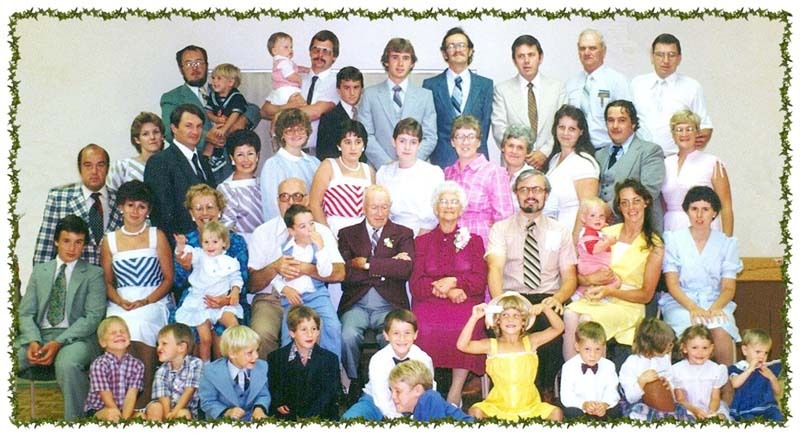 Beek, Etty, Groen, Hunter & Markle Families. To rise, - explore their mirage of delight. No more to hear they tempest thundering might. Kintrails is created from Family Tree Maker 2006 and GedHTree. Kintrails is hosted by inkol.com.